By Frank P. Vazzano, 2008, 322 pp, illus., index Kent State University Press ISBN 9780873389204 Hardcover. 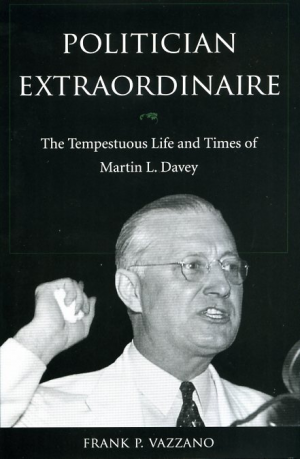 This political biography marks the first full treatment of Kent's own native son, Martin L. Davey. An important figure in the early decades of the twentieth century, Davey served as mayor of Kent, was elected to the U.S. House of Representatives, and completed two terms as Ohio governor. The book includes descriptions of his life from dutiful son to founder of the Davey Tree Company. The first biography of the vagabond and hard-boiled writer who rocked Hollywood during the Roaring Twenties. Marvin Kent, son of Zenas Kent, was a merchant of Kent, Ohio, the planner, promoter, developer.